Micheal Rock from South Carolina has invented a New Solar Thermal Hot Water System that promises to change the way people think about Solar Hot Water. According to rocketdome.net, the invention, called “The Rocket Dome”, is different from anything else on the market. 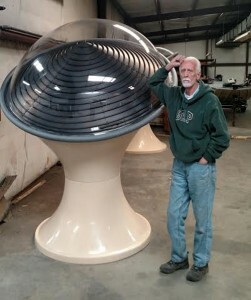 The Rocket Dome has many advantages over traditional solar water heating systems. The RD is far more affordable than other comparable sized solar thermal units. It eliminates any roof penetrations saving time and money if costly roof repairs ever need to be done. Using the Earth as added insulation, the water tank stays warmer longer, and saves valuable space inside your home, inventors say. The Ground Mounting technology allows you to find a great location for your RD even if your roof isn’t ideal for traditional flat solar thermal panels. The RD can usually be installed in one day allowing you to have more time for what really matters. Other solar thermal hot water systems are designed to mount on your home’s southern roof face, which for many can be a problem. This approach adds a lot of weight to your home and damaging holes in your roof. “The best part is it’s half the cost of similar size and quality solar thermal hot water systems, and with the 30% federal tax credit; It should pay itself off long before the 10 year warranty runs out”, creators say on their website. Mr. Rock is now manufacturing The Rocket Dome is Roebuck SC. He’s adding local jobs to the economy and he’s building a Solar Product in America, a market that’s 99% Chinese dominated.